Nissan’s decision not to begin production of a new model of car in Sunderland dominated the media at the start of the week, despite no jobs actually being lost. Brexit naturally got all the blame, despite a large number of other significant factors including falling demand for diesel cars and the EU’s stringent new emissions standards in the wake of Germany’s major diesel fraud scandal. 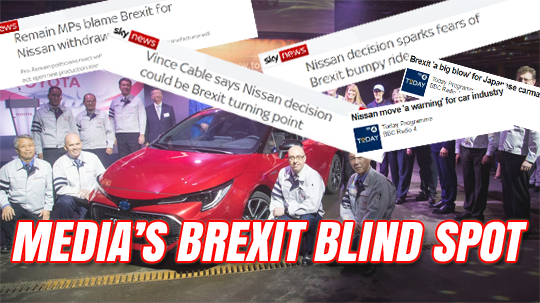 If it was really a Brexit issue why didn’t Nissan just move production to one of their many manufacturing plants in Spain, or France where they have a strategic partnership with Renault?